AlphaNinja - Score one for the activist investors. Ipass (IPAS) agrees to return $40million in cash to shareholders and appoint one of Foxhill's appointees to its board. 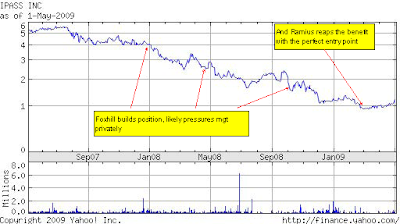 Foxhill, Shamrock, and Ramius capital have filed 13d's over the past year, and it looks to me that Ramius has the best entry price at about an average of $1 per share, so they're up 56%. "REDWOOD SHORES, CA--(MARKET WIRE)--Jun 3, 2009 -- iPass Inc. (NasdaqGS:IPAS - News), a global provider of services that unify the management of enterprise mobility, today announced that its board of directors has determined to take steps to return up to $40 million to stockholders under certain conditions, which determination has been reflected in a settlement agreement with Foxhill Opportunity Master Fund, L.P. (Foxhill). iPass also announced that, as part of the settlement agreement with Foxhill, the iPass board of directors has agreed to immediately appoint a Foxhill nominee, Kenneth H. Traub, to the board of directors. In return, Foxhill will withdraw its previously announced notice to solicit proxies to elect three of its nominees on the iPass board of directors at the 2009 annual meeting of stockholders. As a result, Foxhill will not be delivering any proxies it receives at the 2009 annual meeting. 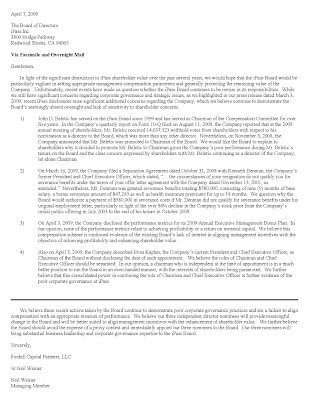 The settlement agreement calls for the board of directors to declare a $20 million cash dividend to stockholders "as soon as practicable" following stockholder approval, at a special meeting of stockholders, of an amendment to iPass' outstanding stock options and equity awards, and related plans. The amendment would provide that the value of the equity awards would not be impaired by the dividend. The special meeting is expected to occur in the third quarter of 2009. The board of directors has also determined to return up to an additional $20 million to stockholders by the end of 2009 through a tender offer, cash dividend or other form determined by the board of directors, subject to certain conditions."